Caribs’ Leap / Western Deep comprises two complementary films that are shown together as a three-screen, synchronised colour video projection. The films were originally commissioned for the Documenta 11 exhibition in Kassel, Germany in 2002. They were then screened in London by Artangel in the former Lumiere Cinema on St Martins Lane in the autumn of that same year and toured by Artangel to the Mead Gallery. The film Caribs’ Leap is projected onto two of the three screens, which face each other. It was filmed on the Caribbean island of Grenada, where the artist’s parents were born, and memorialises a historical incident that took place there in 1651, over 150 years after the explorer Christopher Columbus first arrived at the island. For all this time the local Carib Indians fiercely resisted European colonisation, resulting in a temporary truce with the French in 1650 before fighting erupted again and the French triumphed. The last Caribs chose to jump to their deaths rather than submit to the Europeans, an event that is said to have occurred at a cliff in the town of Sauteurs, now known as Caribs’ Leap. McQueen’s film was shot at the site of this extraordinary act of collective resistance and sacrifice. The larger of the two screens shows the sky and its reflection in the shallow waters of the sea. 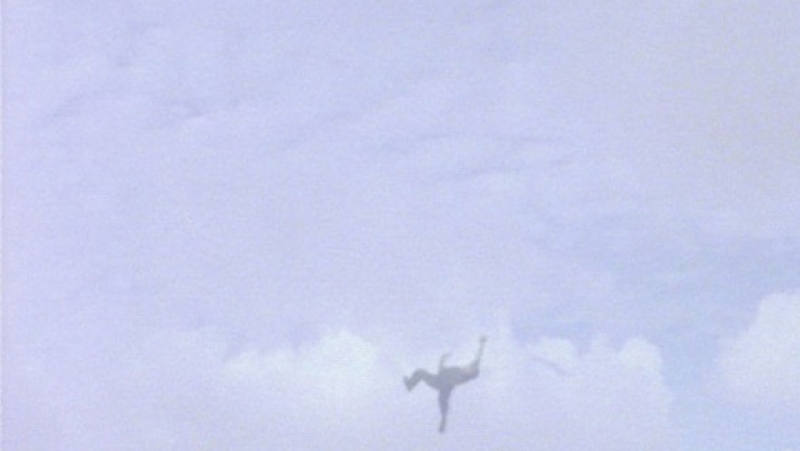 Periodically the calm of the scene is disrupted by a figure falling vertiginously through the air. The figure is viewed mid-flight, never seen jumping or landing. The smaller screen opposite documents the passage of time in Grenada during the course of a day. The film begins in the pale light of dawn. McQueen captures life on the beachfront and the dock where boats pass by. Towards the end of the film the camera moves into a funeral parlour where the dead lie in highly polished coffins. McQueen was inspired to make Caribs’ Leap after visiting Grenada for his grandmother’s funeral; the subject matter of the film is therefore highly personal and elegiac. Western Deep was filmed in the deepest gold mines in the world, the TauTona mines in the Witwatersrand Reef near Johannesburg in South Africa. Three and a half kilometres underground, the mines represent the deepest anyone has been into the core of the Earth. Working at such deep levels has serious and potentially dangerous consequences for the miners. The temperature can read seventy degrees Celsius. In the deepest parts of the mines the pressure above the miners is 9,500 tonnes per metre squared, or approximately 920 times normal atmospheric pressure. The film follows the miners as they descend into the mines in industrial lifts, and conveys the darkness and claustrophobia of the shafts as well as the dust and the noise in such confined spaces. One of the most striking things about the installation, however, is the sound. The Western Deep mines have been functioning under the same management since apartheid. In the depths of the mine the predominantly black miners are shown performing supervised exercises, stepping up and down as red buzzers blare above their heads. Some of them can barely move. The blank and staring faces of the miners and their apparent impassivity to their inhospitable working environment suggest that they are rehearsing their own deaths and interments. The strength and stoicism of the miners indicates the capacity of people to survive in extreme environments, and in this way relates albeit paradoxically to the Caribs’ bravery and defiance in choosing self-destruction over capitulation to a conquering power. The two films are structured around descent: the controlled descent of the miners travelling two miles underground in Western Deep is a counterpoint to the free-falling figure in Caribs’ Leap. With this in mind, it is possible to see the people in Caribs’ Leap as Icarus figures or angelic messengers in contrast to the miners in the underground hell of Western Deep.